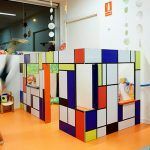 A space for playing, resistant, and decorative Japanese-inspired Kyoto indoor playground, are ideal for developing children’s imagination. 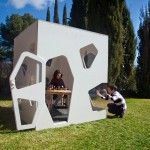 The Kyoto white cubby house, with its 2 walls version, has multiple openings and an original futuristic look. 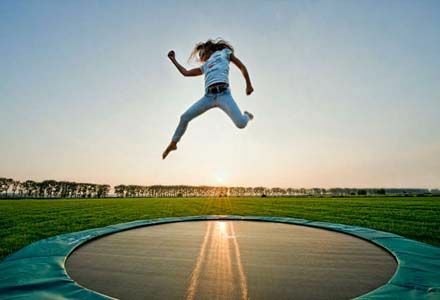 It’s the star spot in any children’s indoor playground. 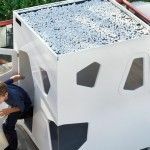 This white cubby house is made up of four outside walls and a horizontal roof. 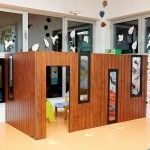 The main material is BLACK MDF wooden boards (Medium Density Fiberboard) coated with melamine with dark wood finishing, 19mm thick. The hardware is made of steel. There are a total of 3 opening, plus one entrance and opened roof. 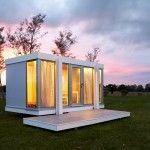 The Kyoto white cubby house is really easy to assemble. 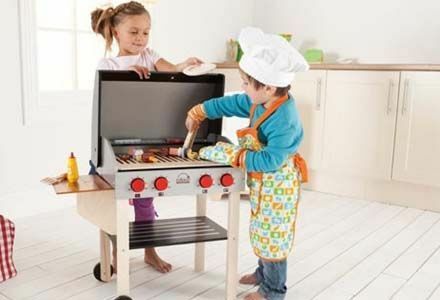 It only takes 15 minutes to set it up! 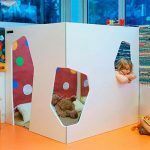 This white cubby house has one door with design handles and finger protection in the hinge area. One operable window, and 5 stationary windows. 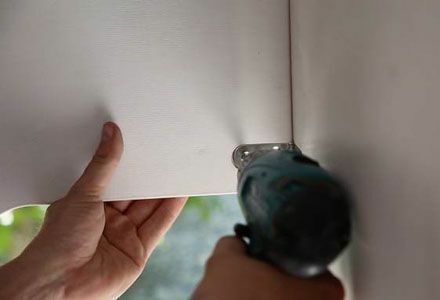 They are all made with methacrylate, and the door opens outward for security reasons. 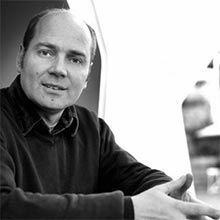 Über stylish We are architects and we love modern design and comfortable spaces. 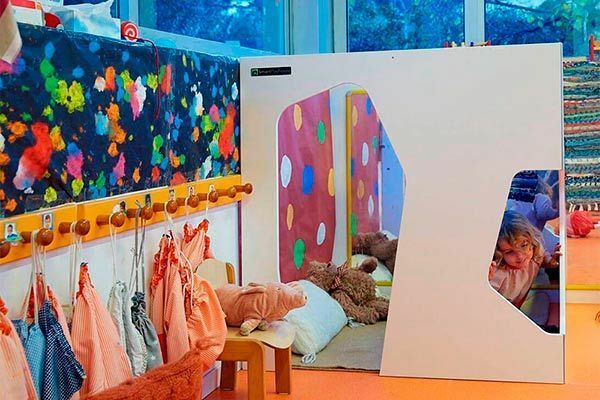 So this white cubby house is an authentic piece of design work inspired by contemporary architecture. 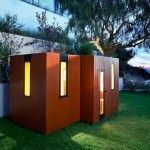 That is what makes them unique and sets them apart from traditional playhouses. 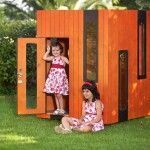 Besides offering a private and safe place for children to play and develop their creativity, our unique playhouses add a touch of contemporary design both to your garden or home interior. 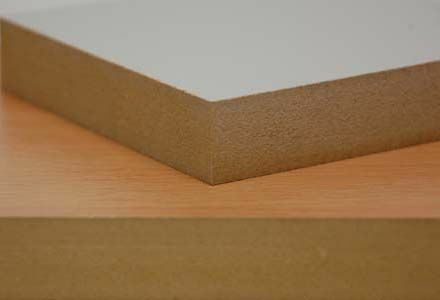 Best Materials The white cubby houses are made of fiberboard (MDF) 19mm thick, with rounded edges all for maximum safety. The models for public use have the edges fully painted for maximum durability. All the fittings are made of steel. 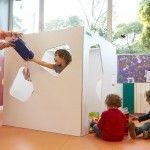 Extra safe and sound White cubby house designed with the children well being and safety in mind so that while they play and have fun, the parents can really relax. 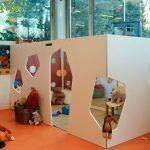 In our indoor playgrounds every detail has been studied carefully to offer an extremely safe space for children, like finger protection, belleved corners, methacrylate glass, water-borne paintings, etc. 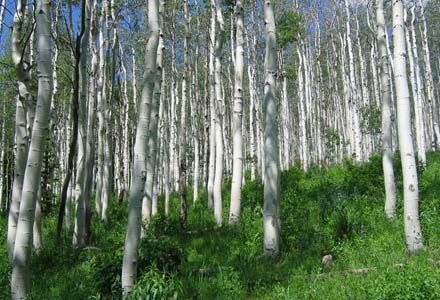 They are designed following strict guidelines that exceed the European and American Safety Standard requirements (EN71 and ASTM F963). Easy Assembly The assembly of this white cubby house is very simple: in 20 minutes, the playhouse will be ready for the children to play in. Every kit includes detailed instructions, and all the fittings for the complete assembly. 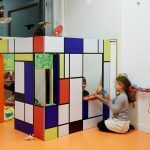 Fitting system to existing walls are not supplied, in the corner playsets. 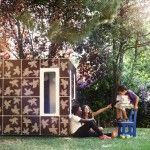 You can find out more about how to assemble our playhouses in the FAQ section. 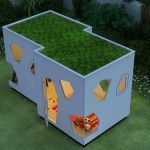 Ecology Indoor white cubby house designed and created to minimize its impact on the environment and follow strict sustainability criteria from the design. 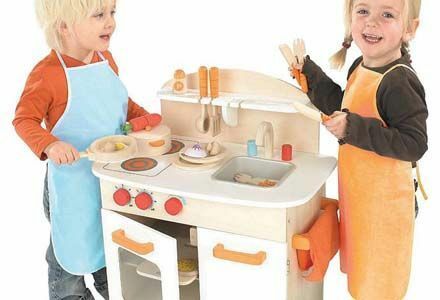 For this reason, each of the elements, materials and necessary processes have been selected to build the playset. 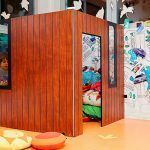 The main material of the indoor playhouse is recycled fiberwood, so only with the material which is used, we contribute to reduce CO2 in the atmosphere. 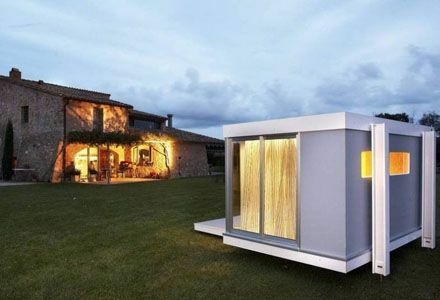 The windows of the houses they are made of methacrylate, an organic material and therefore recyclable. 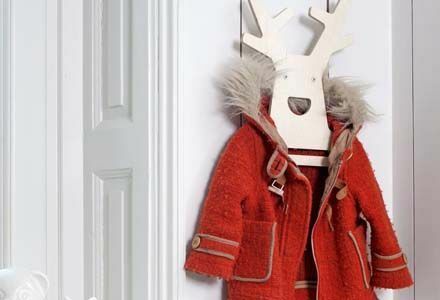 Wooden coat rack Dress your Hang Friends! Hang Friends are not just coat racks, you can hang your coat, your bag, jewelry, newspaper, cell phone or anything else you want. But above all you can dress your Hang Friends. 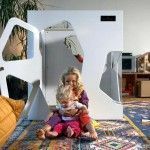 This makes them not only for the hallway but for any place in your home, nursery or kids room or in mom’s room to hang her jewelry. Modern dollhouse Birch dollhouse based on our top-sales Kyoto model. Transportable, and can be closed with magnets. 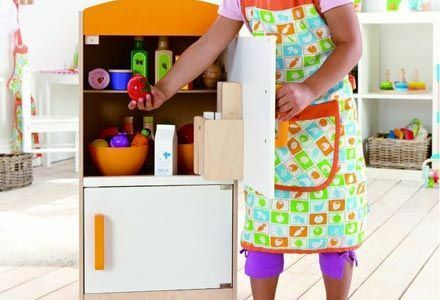 Dollhouse without any furnishing, so the children can play with their toys. 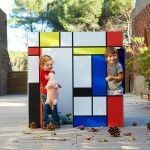 The ideal toy for this indoor cubby house. Table and bench OSKARatWORK Furniture with a warm feeling. The foldable table and bench set OSKARatWORK forms part of perludi‘s please touch! 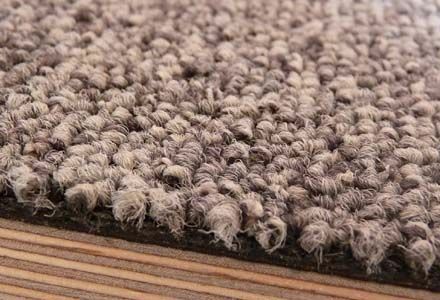 product series made from wood and loden, a soft but wear-resistant traditional Austrian fleece fabric. 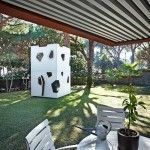 OSKARs original and appealing design results from the combined use of wood for the structural elements and flexible yet highly durable loden fabric covering. 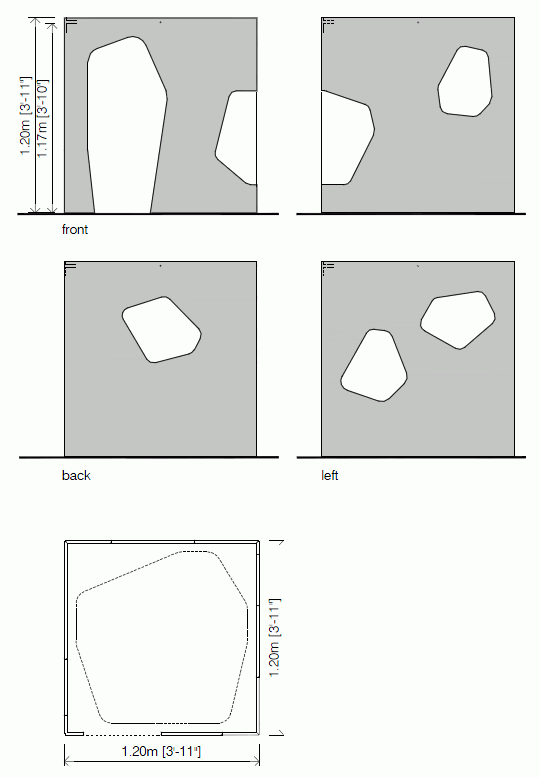 The table and bench are delivered flatpacked and can be unfolded and assembledin just a few easy steps. 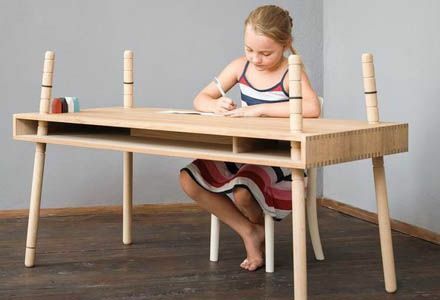 Table with ajustable legs CASPAR OAK A table that grows with you! Any-mal, table and bench set A beast furniture! Any-mal chalkboard set, one table/bench and two stools. Drawing and painting on this furniture is allowed! 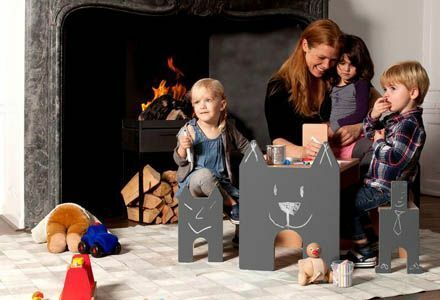 So draw a funny face, a castle or make a good imitation of your father, indeed, on your table and stools! 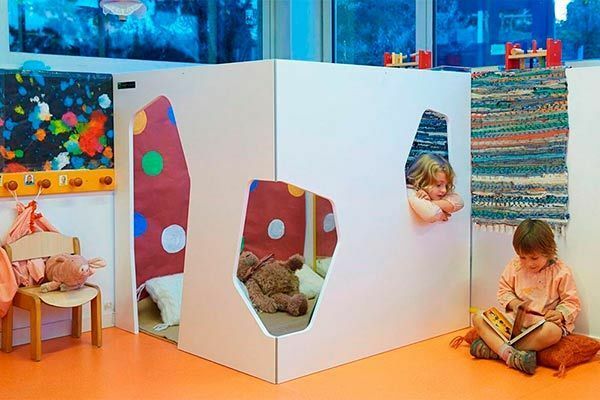 A great complement for this indoor cubby house. 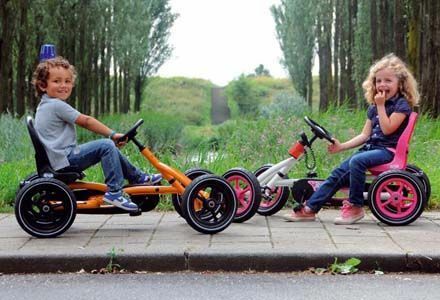 Buddy go-kart The unique BFR system ensures that you can brake with your pedals, and after coming to a halt, you can immediately pedal backwards! 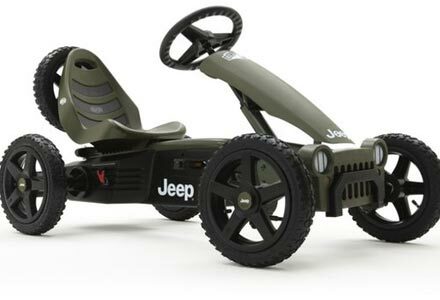 Tearing through puddles; racing around the mud; surviving in the wood… You can go anywhere in your tough go-kart. 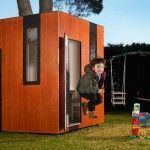 And experience unforgettable adventures together with your indoor cubby house. 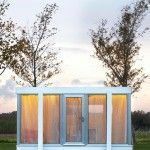 Do you want this white cubby house?